Making your own baby food is not only economical but you also know what is going in your child's food. I recently received a Magic Baby Bullet Baby Care System which I love! And so I did a little Pinterest research and, thus, this little copy-cat baby food recipes list was born. The thing is, my daughter ate TONS of other baby food products. And I wanted to know what was in her food and that there were no preservatives. Now I must admit, I didn't do the best at making ALL of her baby food, although I did try (of course I only had a blender because lightning struck my food processor after one use, no joke). But I did try and buy organic when I could. But that can be pricey. But if you are on a budget (and who isn't, these days? ), making your own baby food is definitely the way to go. So here's a list I have found of my daughter's favorite baby food items, but the Pinterest-found copy-cat version! PLUS some other fun tips and tricks to help you with making your own! This post was originally published on 6/22/13 and is one of my most popular posts to date. I have updated it for all of you because I was better about making baby food for my son. "They aren't the best tasting cookie, rather bland I think. But both my kids love them!! [Son] calls them cookies and I totally don't mind him asking for these because they have either fruit or veggies in and NO SUGAR!!" "Now that I had the pouch, it was time to go to work. I started experimenting, and came up with these recipes, which all turned out to be big hits with the little guy. Every puree listed tastes like fruit rather than vegetables. And check out the colors! What kid doesn't love colorful food?" - Read My Review on the Yummi Pouch, Little Green Pouch, Squooshi Reusable Food Pouches. "This idea had a different kind of appeal because I was pretty sure even my picky eaters who don’t like the yogurt with fruit pieces mixed into it would like these plain, flavored dots! And I was right! They ate them like candy! After all, they look like they COULD be candy. :-) But they are frozen, creamy deliciousness! MUCH better in my book. :-)"
Prep: WASH EVERYTHING! Remove peels, cores, and pits, then dice into smaller/more manageable cubes. Defrost anything frozen. Steam: Hard veggies and fruits need to be steamed. Blend: After everything is steamed until tender, place fruits and vegetables into a blender or food processor until you reach a smooth consistency. Store: For food safety, freeze any purees you won't be using within 24-48 hours. 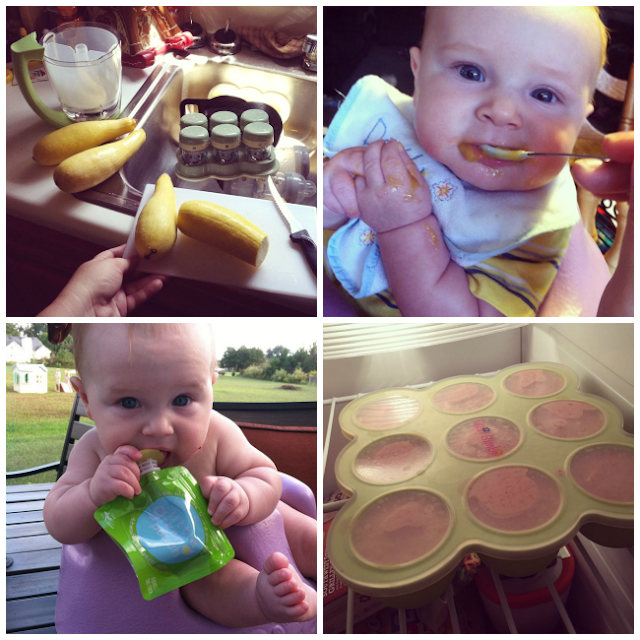 There are products made specifically for freezing baby food because ice cube trays tend to break. Tutti Bimbi Freezer Tray are great to prevent breaking since their containers are rubber and have lids! Check out Sew The Thing Is's post for more Tips & Tricks! If you liked this (and are or know someone who is breastfeeding), you might also like: my tips on boosting supply and/or a recipe for supply boosting cookies. You might also like my Tips to Save Money on Baby. What do you think of these recipes? Do you have any of your own? Thank you so much for collecting these!! What a blessing! You've got a great collection of DIY recipes here! My son still loves the pouches so I'll definitely be filing this post. Thanks. I just found your blog via Monday Mingle. I am your newest GFC follower. Please stop by and follow back if you can. Have a great day! I so enjoy this being done......fresh food and no preservatives for a baby, and that doesn't even account for all the money you save. Great article! Thank you for sharing with the Clever Chicks Blog Hop this week; I hope you’ll join us again! Glad you enjoyed! Thank you so much. 6 month old loved the teething biscuits only thing is he wouldn't chew on just one spot he would chew all around then it would get slimey and he drops it:/ any suggestions? Sorry wish I did. My daughter did the same thing. I would just let her get slimed and feed her in her high chair so if she did drop it, it would be over a tray. Thanks for nice blog. I interested your recopies. These are great and I will have to try them! Love these! I much prefer making my own food!! Way less preservatives!! What an awesome DIY post! The teething biscuits are such a good idea. Wow! I had a few babyfood cook books but nothing that was a great as cop cat recipes like this. Thanks for sharing. I am going to show this to my sister-in-law who just had a baby! This is such an awesome article! Babies food is their most important form of nourishment! I too always learn something new from your useful post. These recepies can save parents a great deal of money buying premade babyfood! And it only takes a couple hours to make a weeks worth of food. I love these recipes. It is so much healthier to use fresh fruits and veggies. I worry that store bought has chemicals and preservatives. good post.thank you for giving this. These are such great recipe ideas. So much better than store bought. Those are great to have. Awesome for sharing!